About Inflow: Boasting resounding lyrics, supreme originality and an unforgettable sound, Up-and Coming Hip Hop group Inflowential is definitely worth noting. 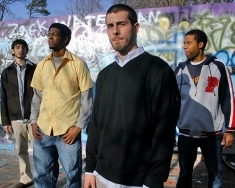 Taking form in the spring of 2003 at NC State University, the group is composed of 2 MC's, a Bassist, and a Beatbox extraordinaire: Tab-One, Charlie Smarts, Bender, and Adid The Abstract, respectively. Ever-growing in popularity, Inflowential's shows never fail to rock the crowd and leave them craving more. Representing real Hip Hop--especially that of NC to the fullest, Inflowential has a sound like nothing they or anyone else have heard before, and cites influences such as The Roots, A Tribe Called Quest, Slum Village, Little Brother, and Blackstar. Having recently released their first album, the Inflow EP (Evolutionary Process), Inflowential is one of the foremost live acts in NC and soon to take over the nation.